I am super excited to share my new favourite product line with all of you! Just before Noah was born there was a recall in the U.S on a pretty commonly used baby product, I was terrified – although not Canada often the products are made the same. So I started doing research as to what exactly is in the products we put on our bodies. Depending on the product.. Perfumes, dyes, mineral oil, papabens and even get this… fermaldahide!! Equaling a lot of nasty toxins! I went to the nearest drugstore soon after and stood in the baby isle and read half the product labels attempting to find something safe for my soon to arrive baby! I didn’t find anything! A few weeks later a friend invited me to an Arbonne spa party where we had a wonderful girls night with facials and got to try out many products! 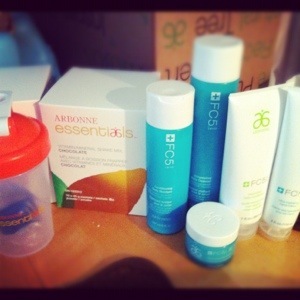 I was super excited because I found out that Arbonne has a baby line! If you haven’t heard of Arbonne Its a Swiss formulated company- safe and pure products which are botanically based! They even have a few health products which are gluten and dairy free! I was so excited at last there was a product safe for my precious baby! I love love love the baby line ! This week though I tried out some of their other products and again fell INLOVE! They make My skin feel so soft and they smell delicious!